Final Year Students: Check your HEAR and BEA! Check your My HEAR page before 15th May! When you graduate, you will receive a HEAR report from the University that itemises your achievements, both academic and extracurricular. 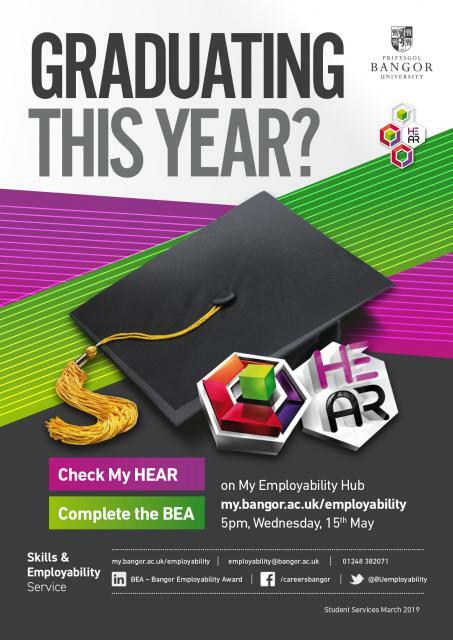 You can check which extracurricular achievements will appear on your personal HEAR by logging onto the My HEAR page on My Employability Hub, My Bangor. HEAR eligibility: All undergraduate students. The deadline to complete the BEA will be 5pm, 15th May, 2019.